Yes, this card is somewhere on this list. This series was originally going to be a part of Nanowrimo (National Novel Writing Month). What was going to take place was that I was going to reveal 5 cards a day for 20 days, or slow roll the top 10 (I hadn’t completely decided), where each card had its own little write-up. Along with the write-up it was going to look pretty fancy with graphics and stylized nicely, like you would see in a publication. It was going to be a fun thing to talk about during the longest break between new set releases where it’s traditionally the slowest Magic news time of the year; it only had the World Championships to compete with at the end of the run. Alas, like everything else lately, I just ran out of time. So I’m presenting the whole list today, only without commentary. What follows is a list of what I consider to be the 100 best designed* cards in all of Magic. And there’s an asterisk with designed because I know that not all cards are designed but developed as well. This is a design blog, and I understand the Development has an equal hand in how the cards you play with shape out. But we’re doing it this way and that’s that. It doesn’t mean that any of these cards are going to be reprinted (in fact, I know that some of them won’t be), but I wouldn’t disagree ripping any of these out of a booster pack in the future. I went through all the Magic cards ever printed. To be on this list they have to be the best designed cards according to modern design standards. There’s no Black Lotus, Ancestral Recall, Maze of Ith, or any of that ilk on this list. Any of these cards could be printed today, and many of them have. They have appropriate mana costs, fit in the right color with the correct philosophy, and are balanced. There are some cards that are/were tournament staples, and some that little to no play outside of casual and Commander. The cards were not given weight to any particular format of limited to constructive (outside of #100 for obvious reasons). 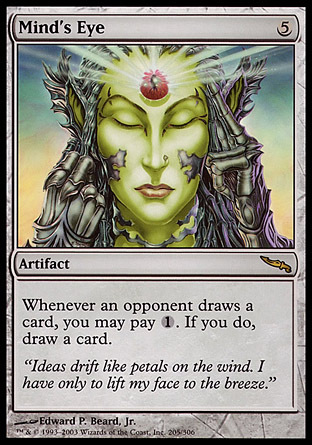 Cycles of cards were considered, and if each card in the cycle was designed very well, it was included as one entry (4 such cycles made the list). I decided that the cutoff to be on this list was M12 so nothing from Innistrad on will be on this list. Of course, this is a highly subjective list. There are some on here that people will disagree with (I’ll talk about #2 in a moment), but this is my feeling of the best designed cards. They were not chosen on this list because they were good for tournament play or that they inspired other cards years later. They were included on this list because the card was well designed; it broke new ground in a well done way, or did a concept the most eloquently. The card, on a whole, makes sense mechanically and flavorfully. Now I believe that #2 will be one of the most controversial cards on this list. I strongly believe that it’s a well designed and balanced card, only the environment it was played in broke it in half. Taken outside of that, there hasn’t been too much issue with the card. There will be a future post (whenever that will be) that I’ll use to try and defend my opinion on that card. Psychatog surprised me, but I suppose in of itself, it’s not too bad. The grave-loving environment pushed it over the edge, however. Also, you say both Creature and Non-Artifact creature. Now, I like ones like Giant Growth (can save a creature, kill a creature, or both), Unsummon (can save a creature or annoy your opponent), and Wave of Reckoning (encourages you to prioritize toughness over power, play lifelink, indestructible, and regenerate; and avoid deathtouch, wither, and infect). And they’re all very simple cards. Commentary would give us a lot more to respond to. That said, your title and criteria are at complete odds with one another. If these are the best-designed cards, why are the criteria “…appropriate mana costs, fit in the right color with the correct philosophy, and are balanced”? Appropriate mana costs and balance are entirely the domain of development. Color and philosophy are a part of both design and development. My criteria for the best-designed cards would be a combination of elegance, flavor, innovation, and necessity. With those criteria, your second 10 look a lot stronger than your first 10. Lightning Helix? Great call. Platinum Angel? Great call. Icy Manipulator? Not so much. What’s so great about Underworld Dreams? Argentum Armor? I’m not seeing it. Ancestor’s Chosen? What? No way. Why is Thoughtseize better than Duress? How is Cryptic Command so high? Why is it better than, for example, Primal Command? Where is Giant Growth? Where is Llanowar Elves? There’s no way Hatred and Biorhythm should be on there. Hell’s Caretaker? Tariff? Really? With those ugly templates? I don’t buy it. Relentless Rats should be disqualified for being the wrong rarity. @Troacctid – Clearly you didn’t read the first few paragraphs explaining HOW he chose these cards. He didn’t pick cards that won the game. He picked cards the brought interesting aspects to the game while at the same time being balanced and in tune with their color. @majiger – Clearly you didn’t read Troacctid’s post. None of his “Why X?” comments were in regards to whether cards “won the game”. They were about how well-designed the cards are. And he’s right. Without some clear reasoning as to why they are well-designed, this is a pretty uninformative list. I mean, basic lands as the #1 cards ever designed? Please. he’s right it should be, Island as the number one best card designed.